Background: The mean age at onset of new cases of rheumatoid arthritis (RA) has increased markedly. Because the prevalence of false positive rheumatoid factor reactions increases with advancing age, the diagnostic value of this test has limitations among the aged. Objective: To study the occurrence of two filaggrin related antibodies in an aged population. Methods: The study covered 300 subjects aged 78–88 years, one of whom had RA. The sera were tested with enzyme linked immunosorbent assays (ELISAs), using filaggrin purified from human skin and citrullinated cyclic peptide (CCP) as antigens. Results: One patient with RA was positive for both antibodies. When the cut off level for positive reactions was set at the 98th centile of healthy blood donors, 24 (8%) of the other subjects were positive for antibodies against filaggrin, but only one against CCP. Conclusion: The test for anti-CCP antibody has better specificity than the test for antibodies against filaggrin among the aged. Rheumatoid arthritis (RA) is associated with several autoantibodies specific enough to serve as diagnostic and prognostic markers.1 Most information is available, by far, on rheumatoid factor (RF). Depending on the test techniques, RF can be detected in 60–80% of sera from patients with RA.2,3 RF is by no means specific for RA, positive reactions occurring transiently in connection with infections, immunisations, and a number of other conditions. Depending on the test systems used, 1–5% of healthy subjects are RF positive. There has been a marked increase in the mean age of new patients with RA.4,5 Accordingly, diseases of the elderly associated with false positive RF reactions due to age, such as osteoarthrosis and polymyalgia rheumatica, will assume increasing roles in the differential diagnosis of RA. A number of autoantibodies target (pro)filaggrin or its components. These autoantibodies, comprising antikeratin antibody, antiperinuclear factor, antibodies against filaggrin purified from human skin or recombinant deiminated filaggrin, and antibodies against filaggrin derived synthetic peptides, occur in 30–70% of RA sera.1 Tests for antikeratin antibody and antiperinuclear factor are based on immunofluorescence,6 and these tests will soon be of historical interest only. Linear synthetic peptides have frequently proved to be disappointing in diagnostic work. Peptide cyclisation resulted in higher specific binding from RA sera and a somewhat higher frequency of positive reactions than the use of linear peptides.7 Commercial test kits are now available for the citrullinated cyclic peptide (CCP) antibody. Compared with RF testing, testing for anti-CCP antibody yields markedly fewer false positive reactions in patients with rheumatic diseases other than RA and in patients with various infectious diseases.7 No corresponding information is available for antibodies against the entire filaggrin molecule. The prevalence of positive RF reactions increases with advancing age. In the work described here we wanted to study whether the increase in the prevalence of antibodies associated with RA in healthy elderly people is a more general phenomenon and tested sera from elderly subjects for antibodies against filaggrin purified from human skin and for anti-CCP antibody. The Helsinki Aging Study is a population based joint study of general and specialised health care in the City of Helsinki, Finland. In 1990, 629 randomly selected people aged 75, 80, and 85 years underwent a comprehensive clinical study. At entry, participants were examined clinically by a nurse, general practitioner, neurologist, and cardiologist. The clinical examinations have been described in detail earlier.8,9 The subjects were re-examined in 1993 (clinical examination including echocardiography), in 1995 (home visits), and in 1999 (home visits including tests for cognition). Serum samples of a random 300 people, taken in 1993 and stored at −20°C, were available for the present study. Serum samples of 33 patients with active RA were obtained from Professor Marjatta Leirisalo-Repo, Department of Medicine, Helsinki University Hospital. Serum samples from 67 middle aged blood donors served as controls. Filaggrin was purified from human epidermis as previously described.10 Briefly, proteins extracted from the epidermis were separated by reversed phase high performance liquid chromatography (HPLC). Fractions containing filaggrin, identified using monoclonal AFA, were then subjected to gel filtration HPLC and, finally, to a second reversed phase HPLC step. Amino acid sequencing and mass spectrometry of internal tryptic peptides were used to confirm the identity of the purified protein. Enzyme linked immunosorbent assay (ELISA) for AFA was performed as described in detail elsewhere.10 Briefly, microtitre plates (Nunc, Roskilde, Denmark) were coated with filaggrin (3 μg/ml in 50 mM carbonate buffer, pH 9.6) and then coated with 1% human serum albumin. Sera were diluted 1:500 and binding of IgG class antibodies to solid phase filaggrin was demonstrated with alkaline phosphatase conjugated γ chain-specific antihuman IgG antibodies. The cut off level for positivity was set at the 98th centile for middle aged (40–65 years) blood donors. The interassay coefficient of variation of the methods was 3% for a high positive reference serum and 8% for a low positive serum. IgG class antibodies to cyclic citrullinated, filaggrin derived peptide, cfc1-cyc, described by Schellekens et al,7 were measured with a commercial kit (RA Immunoscan, Euro-Diagnostica, Malmö, Sweden) according to the manufacturer’s instructions. The limit for positive reactions, suggested by the manufacturer, was 50 arbitrary antibody units. For the determination of RF, an immunoturbidimetric method described earlier11 was used. Figure 1 shows the AFA levels in the sera of elderly people. When the cut off level for the positive reaction was set at the 98th centile of healthy controls, a total of 24 AFA positive subjects were noted, one of whom had RA. Thus, there were 23 cases of false positive reactions, corresponding to about 8%. Figure 2 depicts the anti-CCP level in 300 elderly people, 33 selected RA sera, and 67 controls. Only two anti-CCP positive cases were recorded. The one with the highest level had RA; the other had nothing that could explain the positive finding. Distribution of IgG class antibodies to native filaggrin purified from human skin in sera from 300 elderly subjects. The 98th centile of normal human sera is given as the cut off level for positivity. Distribution of IgG class antibodies to cyclic filaggrin-derived citrullinated peptide (CCP) in sera from 300 elderly people, 33 patients with RA, and 67 normal human sera. Figure 3 shows the RF results in the sera of the elderly people. Fifty two (17%) of the 300 sera had values exceeding 20 international units (IU)/ml, corresponding to the 95th centile of 400 healthy adults (median age 42 years, range 19–60) analysed earlier with this test.11 When assessed against the 98.5th centile (corresponding to 40 IU/ml) of these normal sera, 23 of the elderly people (8%) were RF positive. Twenty eight of the 33 (85%) RA sera tested positive for RF (data not shown). Occurrence of RF in sera from 300 elderly subjects. Cut off limits for positivity, at the 95th and 98.5th centiles of 400 normal human sera, determined in an earlier study,11 are indicated. The prevalence of false positive RF reactions shows a progressive rise with advancing age, doubling during each 20 year period.12–14 When using sensitive test techniques, the prevalence is about 2% in the age group 15–34 years, 4% in the age group 35–54 years, 8% in the age group 55–74 years, and still higher at more advanced age. The increase is mainly due to IgM RF, with very little change in IgA RF.14 In line with published reports, the prevalence of false positive RF in the present series of 78–88 years old healthy subjects was 17%. Our control group for AFA and anti-CCP determinations consisted of blood donors aged 40–65 years (mean 50), selected to represent ages of patients for whom immunological tests for RA are typically performed. When the cut off level for positive reactions in the AFA test was set at the 98th centile of controls, about 8% of the elderly subjects yielded false positive reactions—that is, the prevalence was fourfold compared with the controls. For the determination of AFA, we used filaggrin purified from human skin as an antigen. Sufficient material prepared in this way is not available for large scale testing. The published evidence, however, indicates a high correlation between tests based on filaggrin purified from human skin and on recombinant, properly deiminated filaggrin.15 Thus, information derived from the former has certain relevance for the latter. Only a modest correlation existed between tests for AFA and anti-CCP, suggesting that, in part, different antigens elicited the antibody responses.16 Possibly, antigens in filaggrin recognised by the sera from aged subjects differ from those recognised by sera from patients with RA. Whatever the reason, we conclude that the test for anti-CCP has better specificity than the test for AFA among the aged. The authors thank Ms Maria Kiikeri and Ms Pirjo Mäki, RN, for excellent technical assistance. Aho K, Palosuo T. Can outcome of early synovitis be predicted by serological tests? Clin Rheumatol2002;21:97–102. Kyburz D, Carson DA. Rheumatoid factor. In: Firestein GS, Panyay GS, Wollheim FA, eds. Rheumatoid arthritis. Oxford: Oxford University Press, 2000:179–87. Bridges SL. Rheumatoid factor. In: Koopman WJ, ed. Arthritis and allied conditions. 14th ed. Philadelphia: Lippincott Williams & Wilkins, 2001:1223–44. Kaipiainen-Seppänen O, Aho K, Isomäki H, Laakso M. Shift in the incidence of rheumatoid arthritis toward elderly patients in Finland during 1975–1990. Clin Exp Rheumatol1996;14:537–42. Imaraka T, Schichikawa K, Inoue K, Shimaoka Y, Takenaka Y, Wakitani S. Increase in age at onset of rheumatoid arthritis in Japan over a 30 year period. Ann Rheum Dis1997;56:313–16. Youinou P, Serre G. The antiperinuclear factor and antikeratin antibody systems. 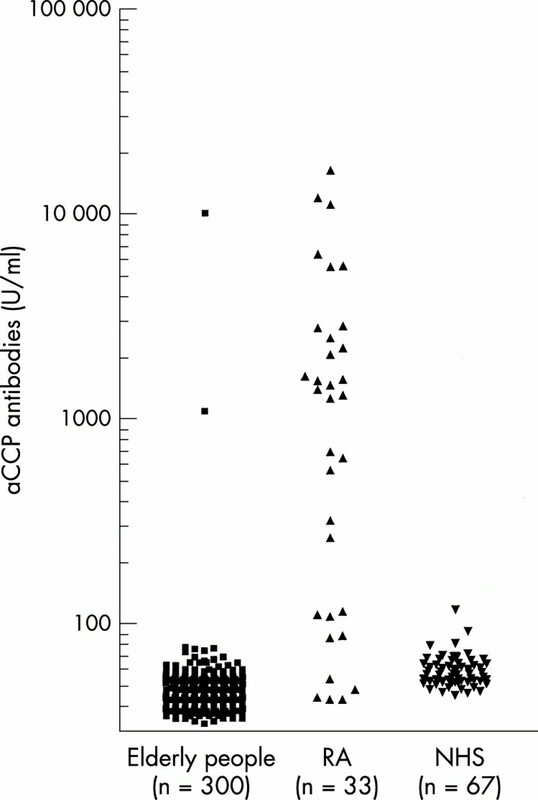 Int Arch Allergy Immunol1995;107:508–18. Schellekens GA, Visser H, de Jang BAW, van den Hogen FHJ, Hazes JMW, Breedweld FC, et al. The diagnostic properties of rheumatoid arthritis antibodies recognizing a cyclic citrullinated peptide. Arthritis Rheum2000;43:155–63. Tilvis RS, Hakala S-M, Valvanne J, Erkinjuntti T. Postural hypotension and dizziness in a general aged population: a four-year follow-up of Helsinki Aging Study. J Am Geriatr Soc1996;44:809–14. Tilvis RS, Strandberg TE, Juva K. Lipoprotein E phenotypes, dementia and mortality in a prospective population sample. J Am Geriatr Soc1998;46:712–15. Palosuo T, Lukka M, Alenius H, Kalkkinen N, Aho K, Kurki P, et al. Purification of filaggrin from human epidermis and measurement of antifilaggrin autoantibodies in sera from patients with rheumatoid arthritis by an enzyme-linked immunosorbent assay. Int Arch Allergy Immunol1998;115:294–302. Nykänen M, Palosuo T, Aho K, Sahi T, von Essen R. Improved immunoturbidimetric method for rheumatoid factor testing. J Clin Pathol1993;46:1065–6. Mikkelsen WM, Dodge HJ, Duff JF, Kato H. Estimates of the prevalence of rheumatic diseases in the population of Tecumseh, Michigan, 1959–60. J Chron Dis1967;20:351–69. Aho K, Tuomi T, Heliövaara M, Palosuo T. Rheumatoid factors and rheumatoid arthritis. Scand J Rheumatol Suppl1988;18(suppl 74):41–4. van Schaardenburg D, Lagaay AM, Otten HG, Breedveld FC. The relation between class-specific serum rheumatoid factors and age in the general population. Br J Rheumatol1993;32:546–9. Nogueira L, Sebbag M, Vincent C, Arnaud M, Fournié B, Cantagrel A, et al. Performance of two ELISAs for antifilaggrin autoantibodies, using either affinity purified or deiminated recombinant human filaggrin, in the diagnosis of rheumatoid arthritis. Ann Rheum Dis2001;60:882–7. Goldbach-Mansky R, Lee J, McCoy A, Hoxworth J, Yarboro C, Smolen JS, et al. Rheumatoid arthritis associated autoantibodies in patients with synovitis of recent onset. Arthritis Res2000;2:236–43.